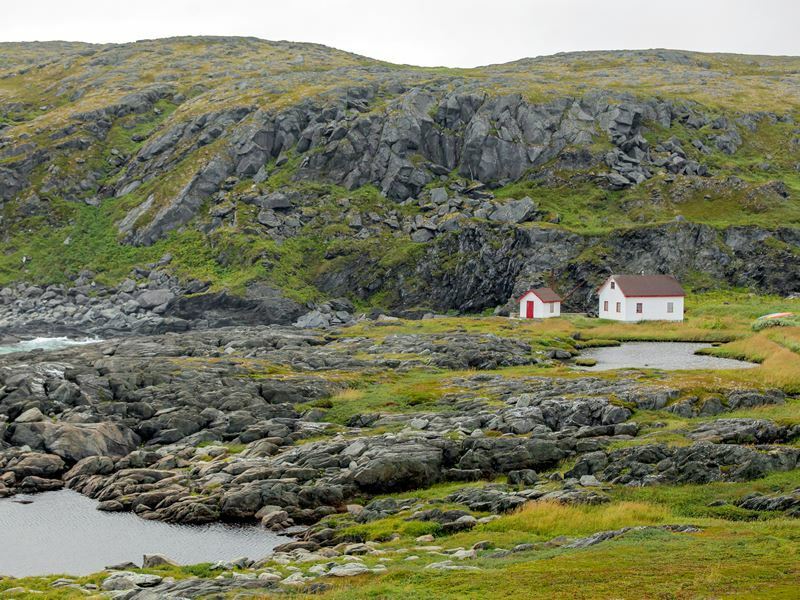 Newfoundland’s west coast is home to the dramatic Long Range Mountains which are dotted with freshwater fjords, beautiful beaches, lighthouses and charming seaside villages. Further north, the Great Northern Peninsula, which extends to L’anse aux Meadows, the only authenticated Viking settlement site on the continent, is one of the best places for iceberg viewing and whale watching. In the spring, polar bears occasionally float in on one of the bergs that fill the coves along the coast. Your unforgettable adventure all begins with a flight to Deer Lake Regional Airport. In the winter Marble Mountain is popular for skiing, but when that snow has melted, visitors can enjoy all sorts of warmer weather activities. 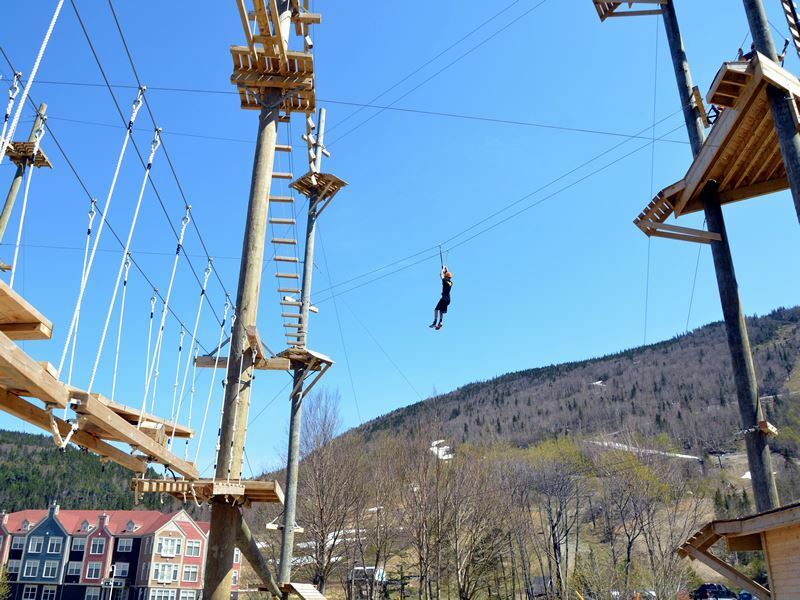 Just 30 minutes from the airport and you can be whizzing across a zip line with Marble Zip Tours which offers nine ziplines that traverse Steady Brook Gorge and Falls for a variety of fun picks. There’s also an aerial obstacle course with three levels of obstacles that are suspended as high as 50 feet above the ground. The mountain is ideal for hiking with miles of scenic trails, and it also hosts indoor and outdoor concerts. Your next stop is less than an hour down the road. 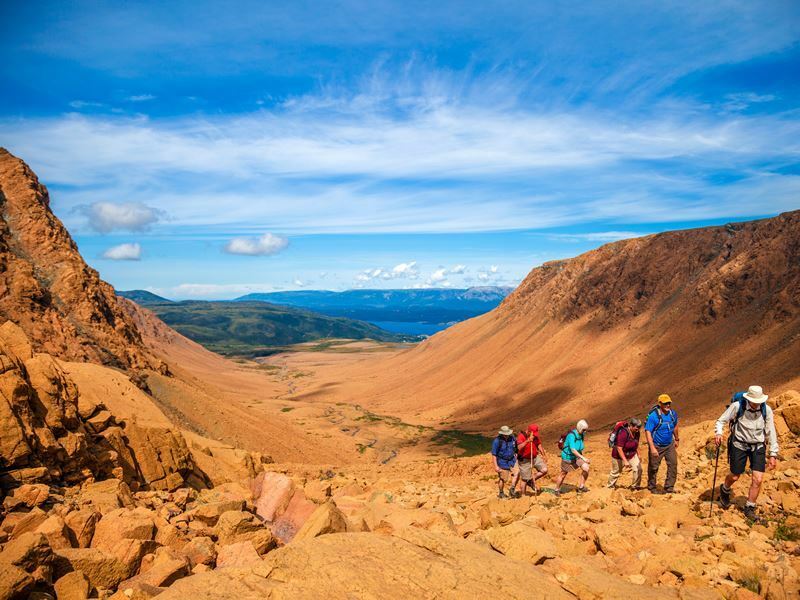 Gros Morne National Park is sometimes referred to as the most magnificent park you’ve never heard of. Not only is it filled with incredible sights, but it also happens to be the place geologists proved the theory of plate tectonics. The Tablelands, a mountain of flat-topped rock that’s usually only found deep within the Earth’s mantle, is just one of the many highlights. There are several towns that provide a good base for exploring the park, but it’s hard to beat Rocky Harbour, with one of its most popular properties, the Ocean View Hotel, expanding for the 2019 to accommodate the increasing number of travellers that are coming to experience this unique destination. It hosts the Anchor Pub, renowned for live entertainment, which frequently includes traditional Newfie tunes and Kitchen Parties. A Newfoundland Kitchen Party is a famous tradition with makeshift jam sessions that are typically hosted in kitchens and living rooms throughout the province. They often include a guitar, accordion and an ugly stick or two – an odd homemade instrument fashioned out of various household items, typically a mop handle with tin cans, bottle caps, small bells and other noise makers, and played with a drum stick. Guests are always welcome to bring their own instruments and play along or get up and dance. You’ll find plenty of ways to get out and explore the scenery too. Just minutes from Rocky Harbour, Lobster Cove Head Lighthouse, sits at the northern side of Boone Bay’s entrance and is open for public tours. 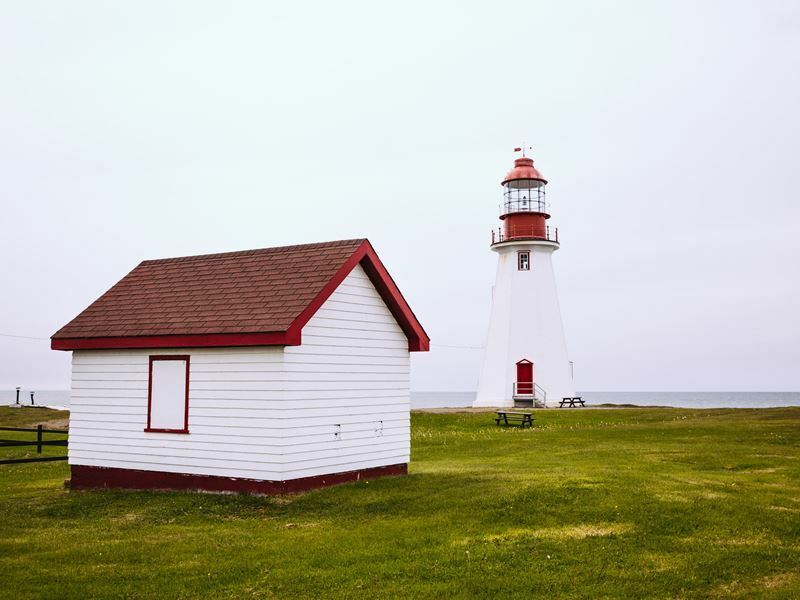 A lot more than a lighthouse, it also serves as a museum featuring interpretive exhibits that showcase the history of early residents who lived nearby along the shore and their dependence on the sea for survival. The grounds that surround the lighthouse are especially picturesque and include a trail that meanders through the forest and along the coast, providing a fantastic spot for whale watching and colourful sunsets. 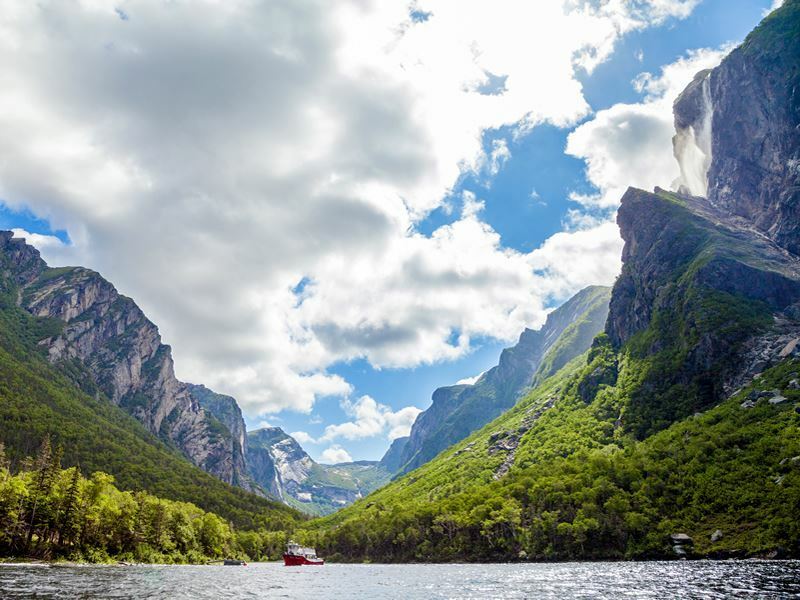 The most popular attraction in the area is the Western Brook Pond boat tour. It all begins with a walk on a two-mile trail leading from the Western Brook Pond parking lot, about 20 minutes north of Rocky Harbour. You’ll hop aboard the boat sailing between massive billion-year-old cliffs dotted with magnificent waterfalls that plunge into the freshwater fjord below. Watch for wildlife along the way and enjoy the entertaining, informative narrative provide by knowledgeable local guides. In the park’s southwest corner are the Tablelands, a massive flat-topped mountain range that was part of the Earth’s mantle before it was raised by tectonics, bringing it to the on top of the continent. Take a guided walk across the mantle to get a better understanding of just how unique the park’s geology really is. This area is also a great place to spot caribou, moose, Arctic hare and bear. Baker’s Brook Falls is a stunning sight with the series of cascades falling across limestone ridges and can be reached via a fairly easy six-mile roundtrip hike that winds through balsam fir forest, much of it over boardwalk. Bring a picnic and you can enjoy the sight from one of the viewing platforms while fuelling up for the return. Moose are frequently spotted along the trek – even if you don’t see the animals, you’re likely to see plenty of evidence they’ve been there. The forest is in several stages of regeneration as it’s in the process of recovering from the natural effects of insects and winds, though heavy moose traffic has limited regrowth in many areas. In the town of Rocky Harbour itself, you’ll find a number of interesting gift and souvenir shops as well as some outstanding eateries. Earl’s is a local favourite where you can try delicious moose dishes like burgers and stew, while Java Jack’s is an unexpected foodie haven serving fresh seafood and wild game. It sits within a bright yellow heritage house overlooking Bonne Bay with its own organic garden that supplies its greens and other vegetables. While it’s always hard to leave Gros Morne, you’ll have a lot more to look forward to as you make your way to the Great Northern Peninsula. While it’s less than a four-hour drive from Rocky Harbour, you’ll want to take your time, stopping to enjoy jaw-dropping views of the Gulf of St. Lawrence and keeping an eye out for moose. The drive is rated as one of the most beautiful in all of Canada. At the midway point between Rocky Harbour and St. Anthony is Port au Choix. Take a break to stretch your legs and explore 6,000 years of human history at the Port au Choix National Historic Site. The sea’s bounty attracted Maritime Archaic, Dorset, Groswater and Beothuk people to this area long before the Europeans arrived. The seals that frequently passed on the ice flows were hunted for clothing, shelter and food. At the visitor centre you can learn more about one of the most fascinating archaeological finds in North America, view original artefacts like harpoons and slate spears, and visit ancient settlements and burial sites. 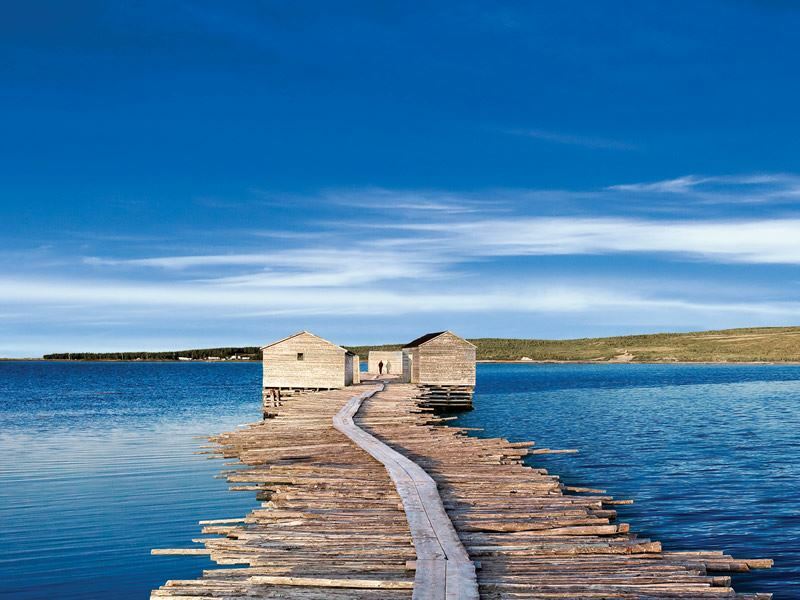 The largest town on the Great Northern Peninsula, St. Anthony is filled with countless wonders. A place where you’ll be mesmerized by icebergs in the spring and the majesty of whales in the summer, with moose and caribou spotted frequently in between. To appreciate its incredibly welcoming, hardy people, start with a visit to the Grenfell Interpretation Center. The museum brings to life an era of history that depicts determined, courageous Newfoundlanders battling extreme elements to survive, and help others do the same. Dr. Wilfred Grenfell was a real-life hero who played a significant role in the heritage and ultimate success of St. Anthony. His long-time residence, Grenfell House is open for public tours. The early 1900's home stands alone on a hill near the local hospital and features many exhibits and artefacts that tell Grenfell’s story and the history of the Great Northern Peninsula. If you’re up for a climb, Fishing Point Park is the place to go. You won’t miss the flights of stairs with 476 steps winding along the side of the steep hill leading to the top of Fishing Point Head where you’ll enjoy an awe-inspiring panoramic view of the sea, and often icebergs in the spring, and whales in the summer. Visit in June, and you could be lucky enough to witness both. Afterward, feed your appetite with a meal at the Lighthouse Restaurant below which serves fresh seafood, to-die-for fish cakes and more, with big picture windows showcasing gorgeous views. 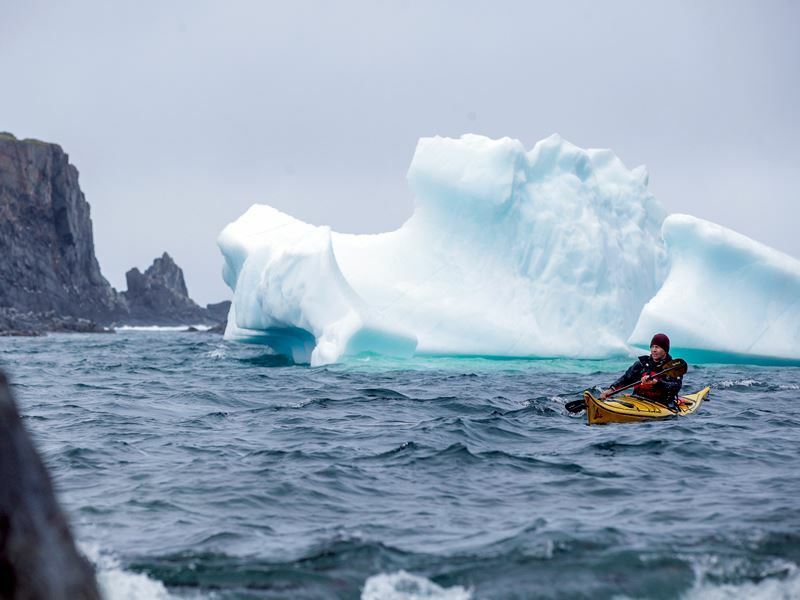 St. Anthony hosts the annual Iceberg Festival in late spring every year which runs for 10 days and features a variety of events that are hosted throughout the area, including the villages of Straitsview, St. Lunaire-Griquet and Raleigh, as well as St. Anthony. This is not only a peak time for iceberg viewing, with Northland Discovery Boat Tours, taking passengers out to see the glistening white and blue bergs up close (and whales in season), but you can join in or watch the especially courageous jump into the frigid ice-filled waters during the Polar Dip. Live music and all sorts of fun events are hosted at multiple venues, including Hot Skipper’s Lounge in Straitsview which also offers one of the best “Screech-Ins” in the province. This is your chance to become an honorary Newfoundlander. In between sets of lively tunes, you’ll put on rain boots, a nor’easter hat and rain slicker before being asked if want to be a Newfoundlander. After taking a bite Newfie steak (bologna), kissing a cod fish, choking down a dried capelin fish, drinking a shot of the local Screech rum and doing a dance, you’ll be an honorary Newfie and get a certificate to take home that proves it. 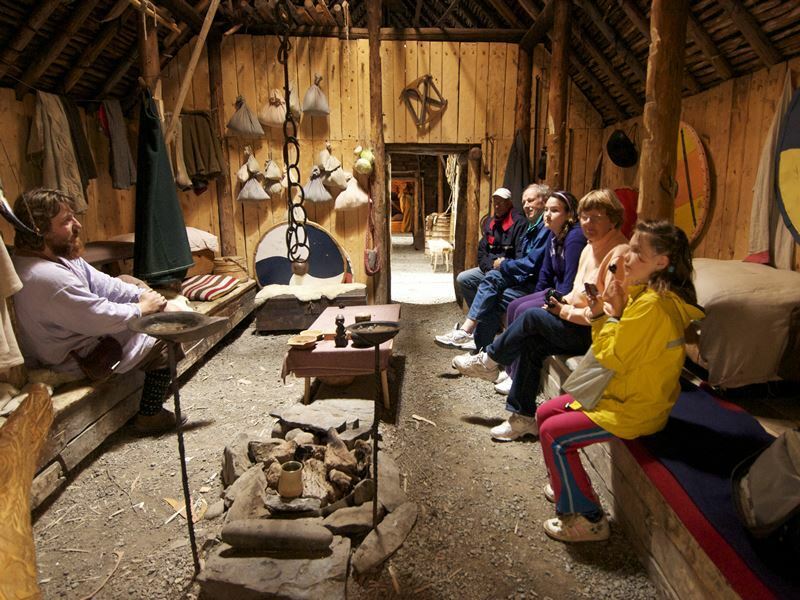 L’Anse aux Meadows, located on the northernmost tip of the Great Northern Peninsula, provides proof that the Vikings set foot in North America around 1003 as the continent’s only authenticated Viking settlement site. You’ll be able to explore a recreated turf-walled longhouse and even collect pebbles from a beach on which famed explorer Leif Ericson may have even walked across himself, all while discovering what life was like here over a thousand years ago. Nearby is a recreated Viking port of trade called Norstead where you can throw an axe, try your hand at a traditional Norse game, watch yarn being spun and even sit in a chieftain’s chair holding a drinking horn and sword. After exploring this fascinating area, you won’t want to miss a mouth-watering feast of locally-harvested seafood, wild game and other specialties at The Norseman Restaurant nearby. The ocean views and sunsets here are as unbeatable as the food, and this is also a spot where whales, icebergs and moose can be seen. If you meet Norseman owner Gina Noordhof, ask her about the connections between her family and The Shipping News, written by Pulitzer Prize-winning novelist E. Annie Proulx while she lived here. Noordhof herself is an author who has written children’s books like A Puffin Playing by the Sea. Located off the north-east tip of the peninsula, Quripon Island offers a unique opportunity to stay in a historic lighthouse. It’s the only accommodation option on the island, bringing the chance to be immersed in tranquillity while leaving the high-tech world behind. Instead, enjoy the sights and sounds of the waves, and, frequently whales with humpbacks and orcas often coming so close to the shore you can almost touch them. After dark, the only light comes from the flash of the lighthouse, which means stargazing is incredible – and, you might even catch a display of the colourful northern lights.